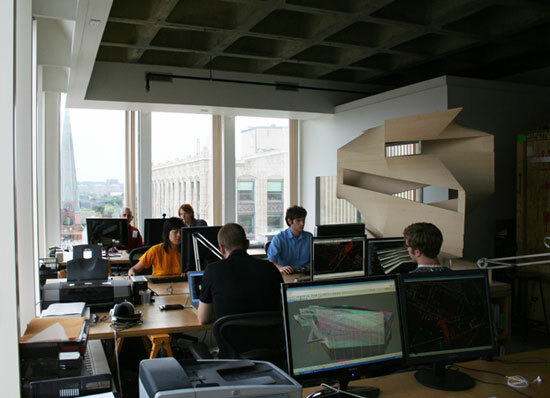 Preston Scott Cohen, Inc. is a full service firm with a team of six architectural designers and two project architects. Commissions encompass projects of diverse scales and types including houses, educational facilities, cultural institutions and urban designs for private owners, institutions, government agencies and corporations . Preston Scott Cohen is the Chair of the Department of Architecture and the Gerald M. McCue Professor of Architecture at Harvard University Graduate School of Design. He is the author of Contested Symmetries (Princeton Architectural Press, 2001) and numerous theoretical and historical essays on architecture. His work has been widely published and exhibited and is in numerous collections including The Museum of Modern Art, New York, The Cooper-Hewitt National Design Museum, San Francisco Museum of Modern Art, Museum of Contemporary Art, Los Angeles and the Fogg Museum of Art, Harvard. He lectures regularly in prestigious venues around the world. Cohen’s work has been the subject of numerous theoretical assessments by renowned critics and historians including Sylvia Lavin, Antoine Picon, Michael Hays, Nikolaus Kuhnert, Terry Riley, Robert Somol, Hashim Sarkis and Rafael Moneo. He was the Frank Gehry International Chair at the University of Toronto (2004) and the Perloff Professor at UCLA (2002). He has held faculty positions at Princeton, RISD, and Ohio State University. Nemlich is a licensed Israeli architect and received his professional education from Technion University in Tel Aviv. Currently, he is the Project Architect for the Tel Aviv Museum of Art, the Taiyuan Museum of Art and the Datong Library. He has developed remarkable techniques for working within the difficult geometric forms of these projects, integrating structural and mechanical systems by combining traditional and computational means. Prior to joining PSC Inc in 2005, he was at Ada Karmi and Partners where, from 1998 to 2004, he served as the Project Architect for the Rothchild Open University in Ra�anana (43,000 m2, 70M$). Quintal is a licensed architect in the United States and Canada. He specializes in real estate development projects, project management and construction administration. He received a BArch from Universite de Montreal, and a Master Degree in Real Estate Development from the Massachusetts Institute of Technology. At PSC, Inc. Quintal is involved in contract negotiations, program writing, project delivery, zoning and code analysis, community consultations, planning review and permitting.